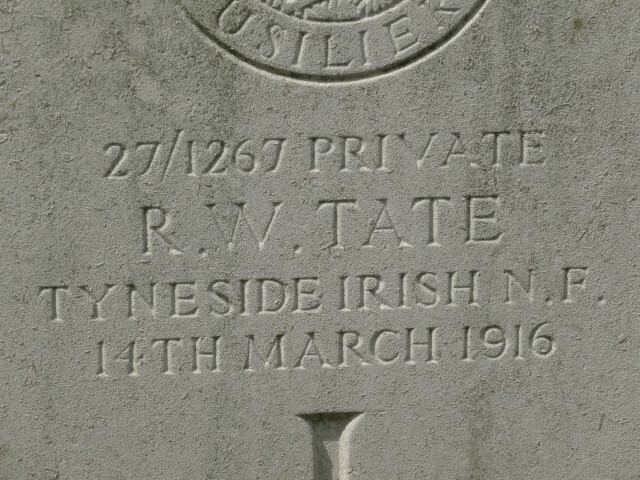 27/1267 Private Richard W. Tate, 27th (Tyneside Irish) Battalion, Northumberland Fusiliers was killed in action 14 March 1916. He was about 32 years old and is buried at Brewery Orchard Cemetery, Bois-Grenier, France and is commemorated on the St. Helen’s Colliery Memorial Cottages. Richard Wilkinson Tate was born 1883 at Copley. His parents were probably John and Elizabeth Ann Tate (nee Wilkinson). In 1891, Richard aged 7, lodged with his uncle, George Wilkinson and his family at Bridge Row, St. Helen’s Auckland. In 1901, he still lived with George, now at Tindale Crescent and aged 17, worked as a colliery labourer. By 1911, he lodged with Thomas and Francis Ward at Tindale Crescent and now aged 27 he worked as a coal miner (shifter). 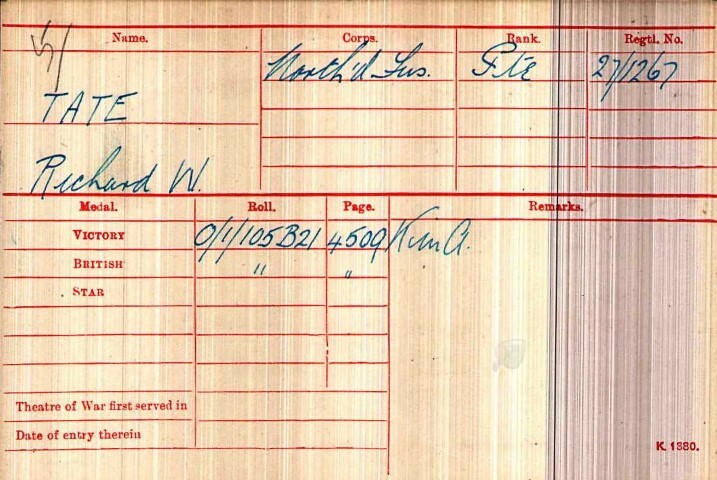 Private Richard Tate’s service record and the 27th Battalion, Northumberland Fusiliers’ war diary have not been researched. The Division landed in France 15 January 1916 and concentrated at La Crosse, east of St. Omer and remained on the western front for the duration of the war.